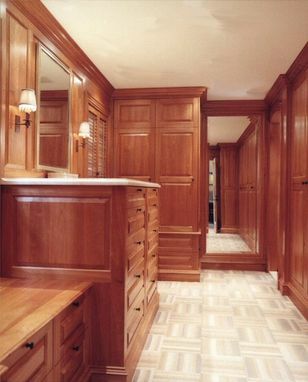 Warm and inviting - this dressing room located off the master bedroom and bath was designed to maximize storage, functionality, and beauty.Raised panel walls and cabinetry, custom moldings and shutters were crafted of solid heart cherry harvested from our own vast sustainable stands in the Adirondacks of New York State. Creating "a place for everything and everyting in its place" was the concept behind this space planning. 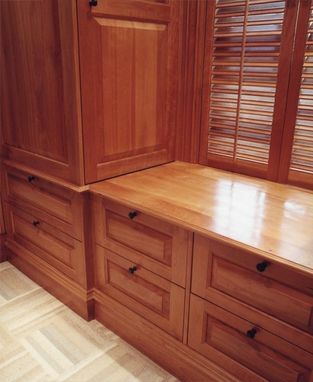 There are drawers galore as well as a place to hang full length garments and a concealed space for a personal safe.